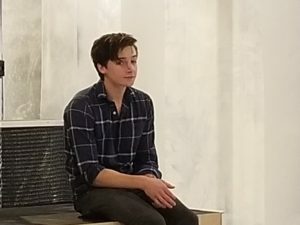 Jordan Champe, playing Oskar, in “Let the Right One In”. Jordan Champe, a general education major at FCC, plans to transfer to the musical theatre conservatory at the end of the semester. Champe plays the role of Oskar who meets Eli in Let the Right One In. Oskar forms a friendship with Eli while dealing with bullying and the murders taking place around him. Jordan learned a lot from his experience in theatre and enjoyed the tightly knit community. Jordan is working on his own playwriting that is a jukebox musical based around Panic! At the Disco’s Death of a Bachelor album and is looking forward to participating in future shows. The play, Let the Right One In, is adapted from the novel under the same name by John Ajvide Lindqvist. The novel focuses on the relationship between the young boy, Oskar, and the vampire, Eli. The main characters, Oskar and Eli, sharing a tender moment. 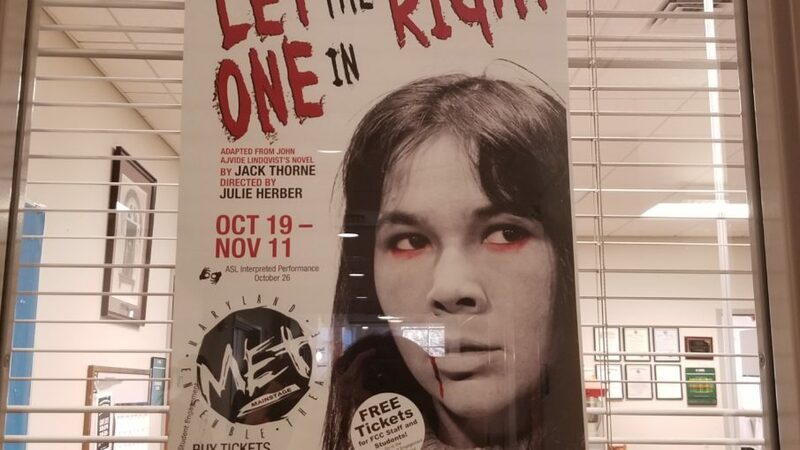 Let the Right One In is showing between October 19th and November 11th at the Maryland Ensemble Theatre in Downtown Frederick. 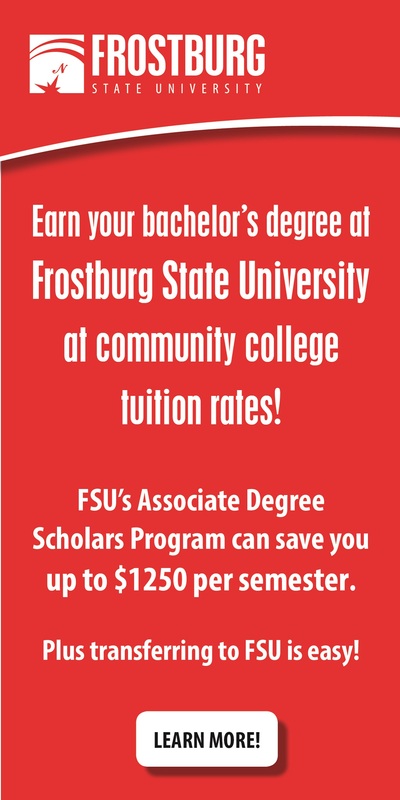 Tickets are available online and students at Frederick Community College can get ticket vouchers in the Center of Student Engagement. Since the play is adapted from a novel, it is difficult to bring the horror genre to life on stage. Julie Herber, a professor at Frederick Community College and the director of the play, brings the novel to life. “I picked this play because it tells a great story,” Herber said. While the play has some scary moments, it is also touching in its message. The story is impactful and makes you think about how others are treated in society for their differences. “The story pulls at the heartstrings. It has a duality of being horrific as well as making the audience think about how we treat outsiders,” Herber said. 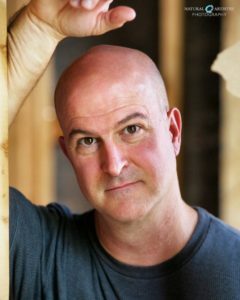 Another faculty member at Frederick Community College, Tad Janes, is a professor as well as the artistic director for the Maryland Ensemble Theatre. The MET has been around since 1992 and is still holding strong in present times as a tool to engage people in theatre and show people that the stage is open to all ages. 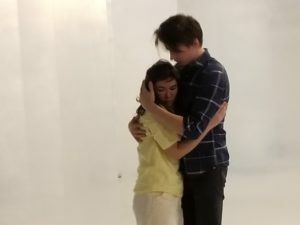 “It is used as a way to prove to young people that theatre is fun and has an impact,” Janes said. In regards to keeping shows on track and working with the artists, he enjoys his job. “No two shows are the same. Each one has a challenge to overcome and any lessons from previous shows can be used and tackled in a different way,” Janes said. Their experience on and off the stage shape the productions and the people involved. Whether they are artists or actors, a family is created and a scene is brought to life with astounding energy from everyone involved. A lot of work, dedication and love goes into each play. The passion for theatre poured out during the groups performance before the audience as they tell their story and bring everyday issues to life under a new perspective.